7 Noahide Commandments. What is this? Why is so little know about this? Why are they important today? Thy God is One! Doesn't everyone believe this? the book of Genesis and Torah Old Testament History of the Righteous Gentile. discoveries not found in Christian influence literature. What evidence can be found to support the correct definition of one God? Who really is the righteous gentile, and its correct definition? Did there exist any faith in God or Religion before Judaism? Many Christians know what is in their bible well, and they can quote scriptures all day long. Many not so seemingly important facts and dates are not there. Example: What year was the old testament completed and sealed? When and who composed the new testament? Was there 500 years between the old and the new? What year was the Ten Commandments given? Was Abraham Jewish or pure Gentile? What years did Abraham live? Did he live under and obey all the Ten Commandments, or did they exist at that time? Was there another "forgotten set" less demanding? What was Abrahams view about "One God" and how he established it? When was the last time you set down and talked to pure Orthodox Rabbi ordained in Israel about his religion? This website will briefly discuss a chapter of what is discovered in the book, setting the foundation on which it is written. It's believed the basics of most world religions are derived from Judaism. According to Jewish Scholars. Judaism was built on the faith and foundations of the God Fearing Gentiles under the blanket of the Seven Noahide Laws. Did the Righteous Gentile communed with God, especially the Righteous Gentile Women? Unlike the church today, why do Jewish scholars recognized Haggar as the first female gentile patriarch, who God spoke to directly? After creation, for the first 2488 years including all of the book of Genesis, why were there no Jews or The 10 Commandments. For humanity and the gentile patriarchs, was there moral standards set by God? Where are these scriptures found? When the second set of commandments, technically should be referred to as The 10 Commandments were given by God, (YHWH, WHVH, Yahweh, or what ever other names, spellings, or titles you may call God) to Moses it was for what's known today as Jewish people only for the children of Israel. 2488 (1313 BCE). What are, why do so few know so little about the history of the first set called the 7 Noahide Commandments, and the covenant between Noah, a gentile, and thy one God for all Gentile Nations. How did these 7 laws become part of the 10 Commandments? What is the difference in the two documents? Can knowledge of the 7 Noahide laws influence how one could interpret the definition of one God? Why can't these most important facts be found explained in Christian influence material? Why are the 7 Noahide Commandments not from the Jews? Why did they document them in there archives? Did they existed prior to the creation of Judaism? The word Noahide is pronounced no-ah-hide. The word Gentile simply means non-Jewish. Facts about the Noahide Laws in the Torah is not a light subject. The President and politicians of America has knowledge of them, yet Christians have so little knowledge of them, and how they are important today in fully understanding them in studying the Bible. The word (Noahide) on search engine results can give upwards of 130,00 entries. Warning: many of these entries whether by Jew or Gentile, tell few of the facts, using threatening hell, fire, damnation views. 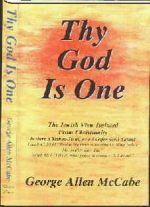 This book "Thy God is One" does not do this, nor does it condemn any religion. "Every so often I receive a book that is so unique, so unusual in some respect that it just has to have some notice taken. to convert to Judaism and recommends not to. This book does not glorify or condemn any religion. Author does not claim to have a special revelation. This book is not about author's interpretations.